Salvaging the Unsalvageable: HFCs and the UN Climate Change Fiasco | Watts Up With That? Support for the global warming/climate change agenda is becoming increasingly desperate, hysterical, and illogical. The causes are many, but chief among them are a plethora of contradictory evidence and growing public skepticism or at least disinterest. There are bizarre parallels to the Frankenstein and Dracula stories. The monster of anthropogenic global warming (AGW) collapses as it turns on the scientists who created it. Dracula needed the energy of blood but knew the dangers of exposure to sunlight. The IPCC failure to consider the Sun is a similar exposure and is causing their demise. The latest desperate move involves the agreement on the reduction of Hydrofluorocarbons (HFC). The Paris Climate Agreement is disintegrating for a variety of reasons all of them inherent in the science and politics from the start of the AGW deception. Promoters of AGW needed a victory, an agreement that appeared to show success in dealing with the alarmism they created. They had to show that Protocols, like the Kyoto Protocol or its replacement the Green Climate Fund (GCF), are effective. They reached back to the Montreal Protocol that they claim was successful. HFCs became a crossover vehicle, a political/science hybrid. When the planet or children’s future are threatened In fact, the Montreal Protocol only appeared to succeed. This is because they applied the major distorting assumption of most environmental disaster claims. A natural change occurs and it is exploited as an unnatural change. Most people think that all change is gradual over long periods of time and variation in nature is almost non-existent. From this, it appears logical to claim that any change is unnatural and caused by humans. The ozone, like all other natural variables, varies considerably over short time periods. A few years ago I was summoned to appear before the Canadian Parliamentary Committee on Ozone in Ottawa. I did not want to go because I know these are orchestrated charades. The truth is not the objective for government or opposition but simply for politicians to promote either a party or a political agenda. It turned out that it was quasi-judicial and I had to appear. A few things happened at the hearing that relate to the current HFC claims. Today, DuPont manufactures hydrochlorofluorocarbons (HCFCs) and hydrofluorocarbons (HFCs) as alternatives to CFCs for the air conditioning and refrigeration industries. A York University (Toronto) professor made a presentation on ozone levels over Toronto. He failed to tell the politicians that there were no ozone readings for Toronto at the time. His data was computer model generated. The politicians did not know it because I asked them. I pointed out at the hearing that ozone reduction due to CFCs claim was an untested, unproven hypothesis. It was doomed to fail because it assumed that insolation, including ultraviolet radiation that creates ozone, was constant. In an interview afterwards I also warned that the replacement (HCFC) was potentially more damaging. Since then we learned among other things that UV varies considerably, Polar Stratospheric Clouds (PSC) affect ozone destruction, there is no empirical evidence that CFCs were destroying ozone. The evidence put forward came primarily from Susan Solomon, a bureaucratic scientist at NOAA who was contributing author to the IPCC Third Assessment Report (2001) and co-chair of Working Group I (the Physical Science Report of the Fourth Assessment Report (2007). Because of Solomon’s connection, I explained in an earlier article how the ozone issue was a dry run for the global warming deception. Over all, the administration estimated that the agreements announced on Tuesday would reduce cumulative global consumption of HFCs by the equivalent of 700 million metric tons of carbon dioxide through 2025. That is about 1.5 percent of the world’s 2010 greenhouse gas emissions, or the same as taking 15 million cars off the road for 10 years. A modern claim equivalent to the medieval question of how many angels on the head of a pin, and equally meaningless. All this is based on assumptions and claims made about HFCs by the IPCC that are simply wrong. Much of it revolves around the designation of HFC as a greenhouse gas with a specific Global Warming Potential (GWP). This was a designation, an artifice, created originally because of the minimal amounts of methane in the atmosphere. Cattle and their methane were identified in claims by people like Jeremy Rifkin as the greater threat to the atmosphere, the planet, and humanity in a book and campaign titled Beyond Beef. Their problem was that methane is only 0.00017% of the total atmosphere and 0.36% of the total greenhouse gases. They needed a multiplier, and it became the GWP. Estimates of problems with this index are wide ranging and constantly changing. The global warming potential is an attempt to provide a simple measure of the relative radiative effects of the emissions of various greenhouse gases. The index is defined as the cumulative radiative forcing between the present add some chosen time horizon caused by a unit mass of gas emitted now, expressed relative to that for some reference gas (here CO2 is used). Derivation of GWPs requires knowledge of the fate of the emitted gas and the radiative forcing due to the amount remaining in the atmosphere. Although the GWPs are quoted is single values, the typical uncertainty is ± 35%, not including the uncertainty in the carbon dioxide reference. They determined the original GWP values on a decision taken at the Conference of the Parties 3, 1997. All GWPs depend on the AGWP for CO2 (the denominator in the definition of the GWP). Emission metrics such as Global Warming Potential (GWP) and Global Temperature change Potential (GTP) can be used to quantify and communicate the relative and absolute contributions to climate change of emissions of different substances, and of emissions from regions/countries or sources/sectors. The metric that has been used in policies is the GWP, which integrates the RF of a substance over a chosen time horizon, relative to that of CO2. The uncertainty in the AGWP for CO2 is estimated to be ±15%, with equal contributions from the CO2 response function and the RF calculation. But there is a bigger problem. The original calculations assumed an atmospheric residency time for CO2 was 100 years. I know there are arguments about what residency time means, but it is irrelevant because the IPCC used the 100-year value in their calculations of GWP. The cumulative error means that HFC has a much lower GWP than is used to promote the claims of the success of the Montreal Protocol. But while important, that is a minor part of the complete fiasco that summarizes as follows. 2. Ozone levels and their variability were and are natural. 3. False science was created to prove CFCs were a problem. 4. A political structure was set up that used the false science to impose completely unnecessary restrictions on a wide range of manufacturing, business, and everyday activities. 5. Dupont produced CFCs originally as an inert, safe, replacement mostly for ammonia in refrigeration equipment. 6. Dupont did not oppose the ban on CFCs because they already had a replacement, HCFCs, and later HFCs, to advance crony capitalism. 7. Politicians pushed by the environmental lobbies produced the Montreal Protocol, that is similar to my description years ago of Kyoto as an unnecessary political solution to a non-existent scientific problem. 8. Most countries were part of the Montreal Protocol but were not required to take any action. 9. A similar deception was created around CO2 with attempts to produce a political solution, the Kyoto Protocol. Again most countries were not required to take action. 10. The Kyoto Protocol collapsed when the false science was exposed through leaked emails. 11. A replacement, the Green Climate Fund, although approved at COP 21 in Paris, is failing. 12. Failure of the Paris agreement required a victory. 13. Elimination of HFCs offered the opportunity to keep the focus on a human cause, link it to the false success of the Montreal Protocol and keep the entire AGW debacle afloat. 14. Dupont will likely produce the replacement refrigerant, and crony capitalism will continue. It is crony capitalism, not good business, because they know the proper science and make a conscious corporate decision. If they don’t know the science, then their license should be revoked. The developing nations suffered from the original CFC ozone destruction claims. The developed world reduced their percentage of food loss between the farm and the table from approximately 60 percent to 30 percent. This was denied to the developing world when CFCs were banned. It was another example of Paul Driessen’s Eco-Imperialism, the imposition of western green agendas that are harmful to people in the developing world. How many more refrigerators does this mean? How many more air conditioners? There never was a problem with CFCs or CO2. Artificial science was created using these beneficial gases to advance a political agenda. Perhaps the ultimate irony in this Alice in Wonderland, but frightening scenario, is the proposal that CO2 become the replacement refrigerant gas for CFCs, and guess who is behind that proposal. October 22, 2016 in Opinion, Ozone. ren I have always thought the high solar activity of SC21 & 22 was directly responsible for the ozone hole during that time, and the eventual reduction of solar activity thereafter was the true source of the ozone hole ‘healing’. Geomagnetic activity was also higher during those two cycles along with higher UV radiation. Nice job again. This stuff is so very simple, and CFCs effectively had nothing to do with it. The climate doomism is based on exploitation of a fear of death. You do X, then you can run the world and stop death has been around for at least thousands of years culturally. CFC hysteria was due to a patent running out, no hysteria over death. The whole thing was contrived BS as every real study was showing that CFCs never reached the ozone “layer”. They were being annihilated by the same UV light that was making it through the ozone layer, and were too heavy in the first place to reach it. I seem to recall that the Montreal protocol allowed some countries to carry on producing cfcs. As they were also being paid to destroy cfcs, a whole new industry was born producing cheap cfcs just so that they could destroyed . No, that was the carbon trading system in Europe. They gave carbon credits for burning freons. An enterprising company produced freon in China, India, and Russia, shipped them to Europe and burned them for carbon credits. Rather like the story about the village somewhere that was plagued with rats, and the council offered a prize for every dead rat that could be produced. A smart boy became the “saviour of the village” and got a lot of money for his impressive catch of rats. It later transpired that he had created a huge rat farm for that very purpose. A company in China schemed $2.7bn doing exactly that. Current distribution of ozone in the southern hemisphere. There is NO destruction of Ozone. It just gets moved out to the 40S-60S latitude during the September to November period (which now has the RECORD ozone levels of anywhere on the planet at any time of year during this period). 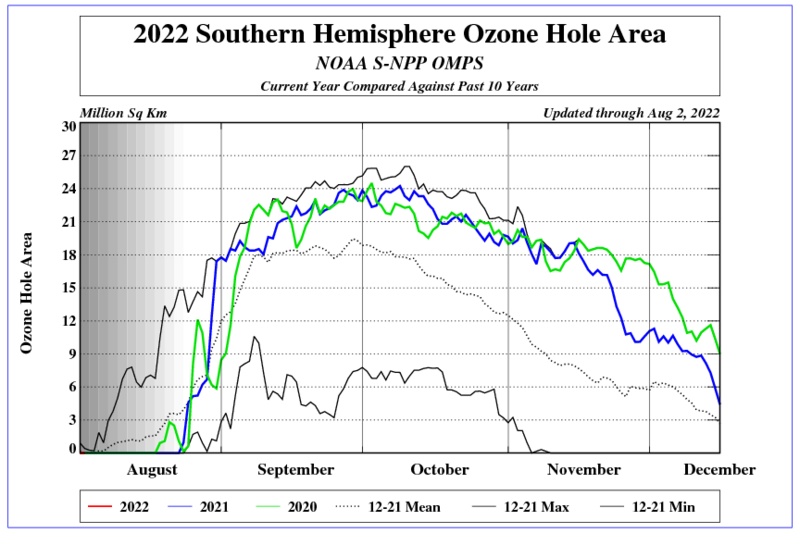 By December, the Ozone moves back to the south pole and NO NET change has happened at all. It is just the south polar vortex and the lack of sunshine from March to September that cause the hole. It is strictly natural and has probably always been there at the end the south pole winter. The Ozone gets swept out and then moves back in. Just look at any animation from this viewpoint and it is clearly just a seasonal phenomenon. He said ‘distribution’ not destruction. OK Bill to be fair maybe you were referring to Dr. Ball’s discussion and not ren’s comment. Number of counts neutrons at the South Pole is almost 3 times higher than in Oulu. Ground station measurements of total column ozone worldwide in the study period 1964-2009 are aggregated into zonal averages. Latitudinally weighted mean global ozone is estimated from these data on an annual time scale. 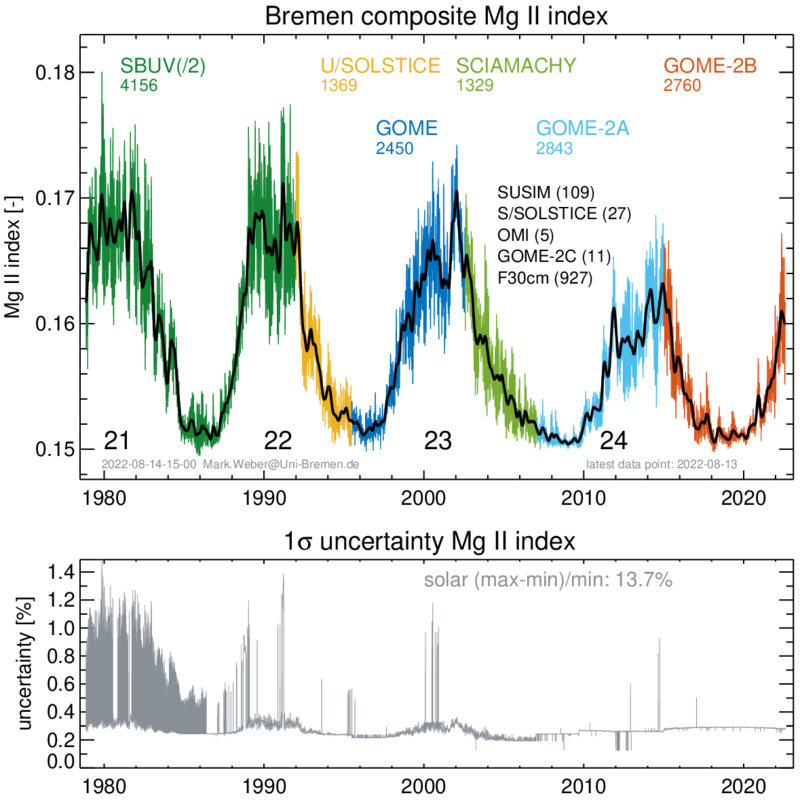 Trend profile analysis of the mean global ozone time series shows a depletion rate of 0.31 DU per year on average across the entire sample period. The observed ozone depletion rate is not sustained and not of a magnitude that has an implication with respect to the ability of the ozone layer to protect life on the surface of the earth from the harmful effects of UV radiation. The results are consistent with prior results for both ground station and satellite data. The findings are inconsistent with the Montreal Protocol and the Rowland-Molina theory of ozone depletion on which it is based. Don’t you just LOVE settled science? Not true, if it were where does the ozone free air come from to replace the air that you claim leaves the polar region? According to you the polar air ( more than 10 mPa O3) between 15 and 20 km altitude moves out and is replaced by air containing 0 mPa O3, but there is no source for that air! 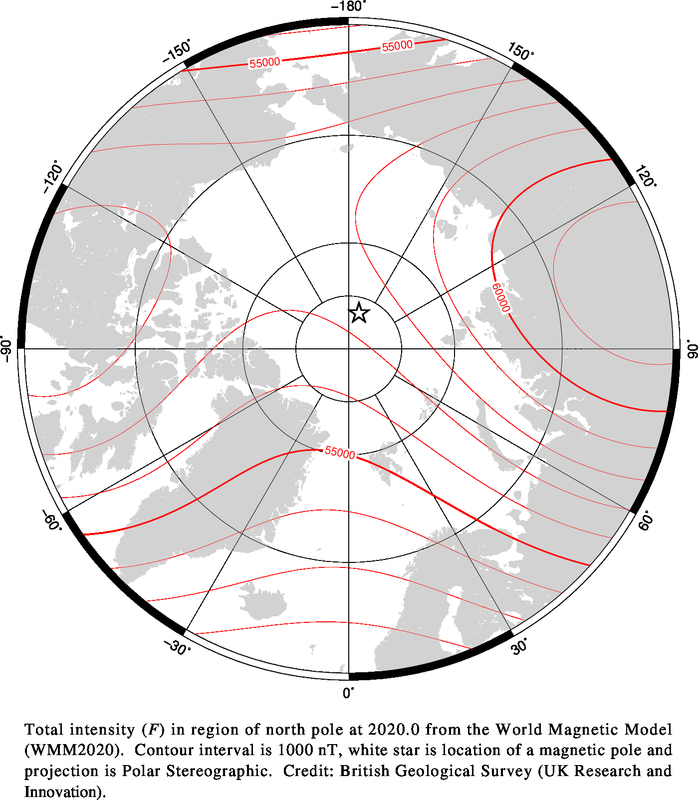 Horizontal intensity in region of South Pole at 2015 from the World Magnetic Model. Add the fact that none are even build to last more than a few years to begin with. Damn those evil commie, pinko, greenie bastards. You really don’t get crony capitalism, do you? They don’t care which ideology they exploit. And their Useful Idiots too, of course. Yes and the new appliances do not clean clothes, dishes, etc., like the ones they replaced because the energy cycles are cut short to meet energy ratings–just ask my wife. My EnergyStar dishwasher re-uses the water to save water (as if you can destroy water). So the rinse cycle is done with food particles in the water, leaving food particles on all the dishes. Super Annoying! The Economist ran a story on the HFCs and CFCs per Montreal. Most of the birdbrains there assumed that the ozone hole had closed up because after all, they wished it and some models told them that it would be gone by some number of scores of years in the future. Presenting the Nasa “movie” of the evolution of the hole from 1978 to the present did nothing to change their mind. I mean it had to be gone right? And yes I comment on TE under the same nome de plume as here. Typical of the comments was: “Before your question can be answered, it first needs to be established that the ozone hole has reappeared, which you state as a fact. What reappearance are you referring to, and what is your source?” My response was: “It never went away. https://www.theweathernetwork.com/news/articles/nasa-and-noaa-report-antarctic-ozone-hole-remains-steady-for-2014/38958” Needless to say, I am not popular on TE. It is amazing that the entire European continent believes in leprechauns and fairies. A very interesting opinion as always with your blog-posts.. If I am not wrong and memory serves me right, there is a very clear statement in IPCC AR5 about GWP (aka AGWP) policy making, a direction and advice to politicians and policy makers……. GWP is not good and proper to be considered for policy making in accordance with the issue of climate and climate change…………That is in the IPCC AR5, if my memory serves me right. Or was it AR4, can’t be sure now at this point ! It still exists in AR4 with slightly different wording… “The GWP and GTP have limitations and suffer from inconsistencies related to the treatment of indirect effects and feedbacks, for instance, if climate–carbon feedbacks are included for the reference gas CO2 but not for the non-CO2 gases. The uncertainty in the GWP increases with time horizon, and for the 100-year GWP of WMGHGs the uncertainty can be as large as ±40%…….. Please also note that basic chemistry states that methane is 7.3 times more potent than CO2 as a GHG until the “GWP” or “GTP” is factored in…… Consequently there are claims that Methane is in effect 20 to 23 times more potent than CO2 but there are those claiming it is 63 to 80 times worse….. depending on what their intended goal is with respect to news coverage and manipulation of the minds of the public, politicians and news medias. I’ve always thought that the Montreal protocol was completely bogus. Any back of the napkin analysis and knowledge of chemistry tells you that the claimed effects of CFCs and how much of that magic gas Chlorine was around would tell you that the stuff was bogus. “7. Politicians pushed by the environmental lobbies produced the Montreal Protocol, that is similar to my description years ago of Kyoto as an unnecessary political solution to a non-existent scientific problem. As has been pointed out here and elsewhere so very many times; this was never about science. This entire exercise in controlling the population has been about corruption, control, cronyism and propaganda. Science itself has nearly been killed off in the process. Do they still try to teach the scientific method in universities? If so, can they maintain a straight face while doing so? 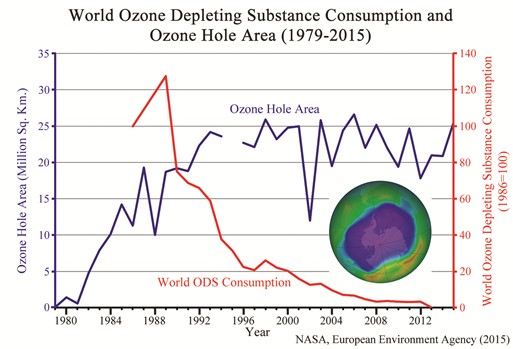 then the stabilization of the ozone hole coinciding with the implementation of the Montreal Protocol is awfully… coincidental. It does not really have any bearing on the AGW debate, for which the case is much less sound (as in, not sound at all), except insofar as a linkage is promoted as a means of diversion. For his data to be “true” they would have had to have found a “hole” of zero extent when they discovered the hole in the Nimbus 7 data. I know many discoveries by the Escathological Cargo Cult are miracles, but even with that, it seems to be a rather low probability. I was up in the Green building at MIT in 1978 when the discovery was made. It was not of zero extent. To show there was no ozone hole in 1979 (and probably before) is very misleading. Maybe it’s just the zero base that is suspicious about this graph, maybe not. Even if it proves to be correct that you can find a baseline of ozone concentration and a calendar time of measurement that arrives at the zero point of the graph, to present it in such a way shows that that is a political graph, not a scientific one. It should also be noted that, according to the above graph, the ozone hole essentially topped out around 1993, a more four years after peak CFC emission, and has a similar 25M km2 today, long after the collapse of CFC emissions. This can’t be reconciled with the claimed very long residence times for CFCs at all, and in fact suggests that any link is extremely dubious, and even contra-indicated. The chart is not labeled completely. 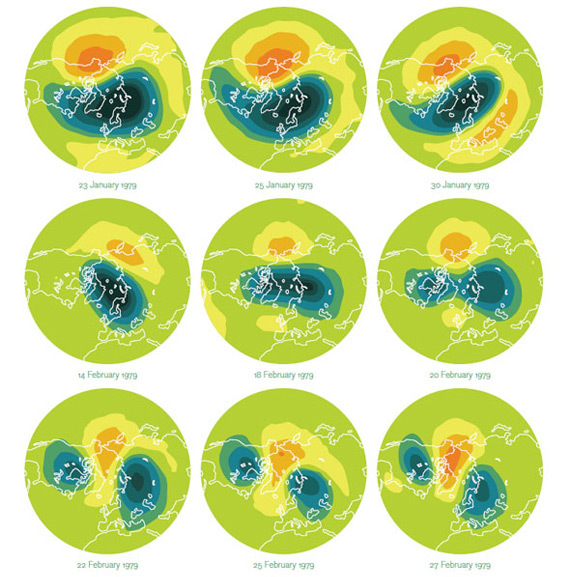 The original that I saw said it showed the square miles of Ozone depleted area at or below 120 DU, a fact omitted by “Phil.” See http://www.energyvanguard.com/hs-fs/hub/88935/file-15962412-jpg/images/ozone-hole-data-toms-antarctic.jpg?t=1476447078974 for the chart. Ozone had been about 200 DU from 1979 (as far back as the chart goes) to about 1982 and then began dropping rapidly to about 120 DU by 1986, a year before the protocol. After about 1986 it has bounced around but has been generally around 100 to 120 and has dropped a bit more, but not much. Thus It is not clear to me that the lower DU values of recent times have anything to do with the Protocol. I read somewhere that Russia was still producing CFCs. So non-zero current production. I went around on this with the occasional commenter who calls himself “Phil” a while back. He convinced me that the narrative was reasonable and fairly well supported. I recall that discussion with a commenter who called himself ‘Bart’ presumably now ‘Bartemis’. Unfortunately monumental deception and distortion pushing false and flawed theories about man made influences regarding the earth’s climate continues to grow as the desperation of failed climate “science” becomes abundantly clear. The scientifically ignorant media which pushes this purely politically driven garbage demonstrates how much the inept and incompetent field of science journalism has degraded over the last three decades. OTOH, had they produced the science then they’d have been pilloried to be stoned. Against this political machine, any relief to be had is in a back room with fat envelopes being passed. You are correct, yam. Dr. Ball’s indictment of Dupont is bogus. Dupont fought the ozone hole from Freon schtick at first. THEY WERE BEAT UP BY THE PRESS, AS A CHEMICAL COMPANY DESTROYING THE ENVIRONMENT. Dupont learned a valuable lesson: when you work under a strong, autocratic central government, it is better to go along with them than to fight them. This was the birth of crony capitalism. You can’t win a rigged game. This game is rigged and Dupont couldn’t choose not to play. So, Dupont must lose, right? Wrong. In this game, Dupont could choose to buy into the house. The hapless players/losers are we the general public. Dupont management benefited itself and satisfied its responsibility to its stockholders in buying into the house. Not that anything can be so pat but Dupont did not call the game. I hope they really said “we’re losing the war”. There has never been any other kind, and the idea that there could be is a fairy tale peddled by ideologues. Capitalism is Marx’s pejorative of free enterprise. Your notion that free enterprise exists only as crony free enterprise is bizarre at best. I would leave the term ‘capitalism’ to spittling collectivists. ‘Free enterprise’ would be better as would any term denoting individual sovereignty. Dr. Ball, thanks for this interesting post. Is the science wrong because the chemistry is wrong? Or is it wrong because the argument turns on relatives rates of formation and destruction of ozone by CFC and HCFCs, relative to the insolation rate changes, obliquity to the sun of the polar areas, polar clouds, etc.? What exactly did the Dupont folks know was wrong? They have never proved that CFC’s caused the ozone hole in the first place. The hole was there the first time they ever looked. It sure appears to be temperature related, and not CFC related, and we wasted billions on this playstation computer model. Maybe it is time for trials for the fraud foisted upon the people of the world by these worthless so called scientists. 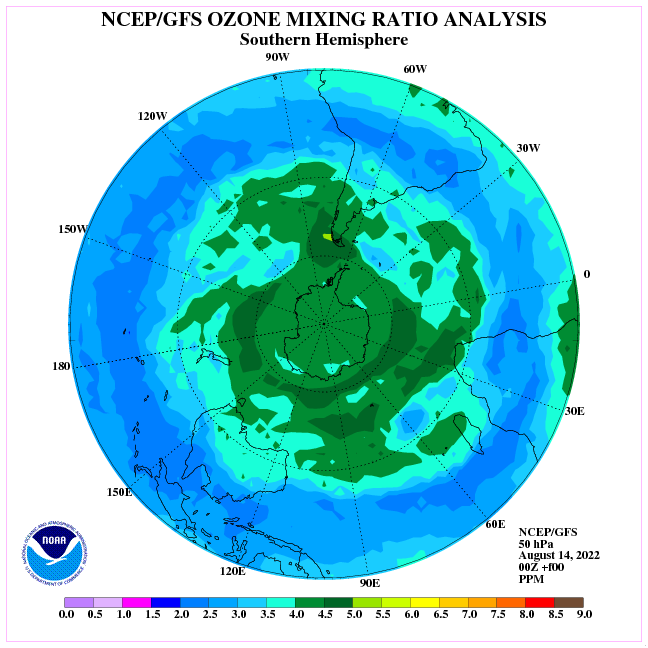 The ozone hole is related to GCR’s from space and bromine, largely from the ocean. See the published works of Prof Lu from Waterloo. I am surprised no one mentioned his works so far. The ozone hole is a huge heat vent. Increased GCR’s open it and cool the earth. If human CFC’s have any influence it is swamped by natural factors. It doesn’t mean we should pollute things of course, but there seems to be little evidence CFC’s do anything important. The chemical pathways are real. That doesn’t make it calamitous. The hole was not there in 1957 (ff.). The hole was detected in the 80s of the last century. The rest of your comment I leave uncomented. They have never proved that CFC’s caused the ozone hole in the first place. The hole was there the first time they ever looked. It certainly was not there when they looked in the 50s, ozone levels were then about 300 Dobson units at minimum subsequently it dropped by a factor of 2+. 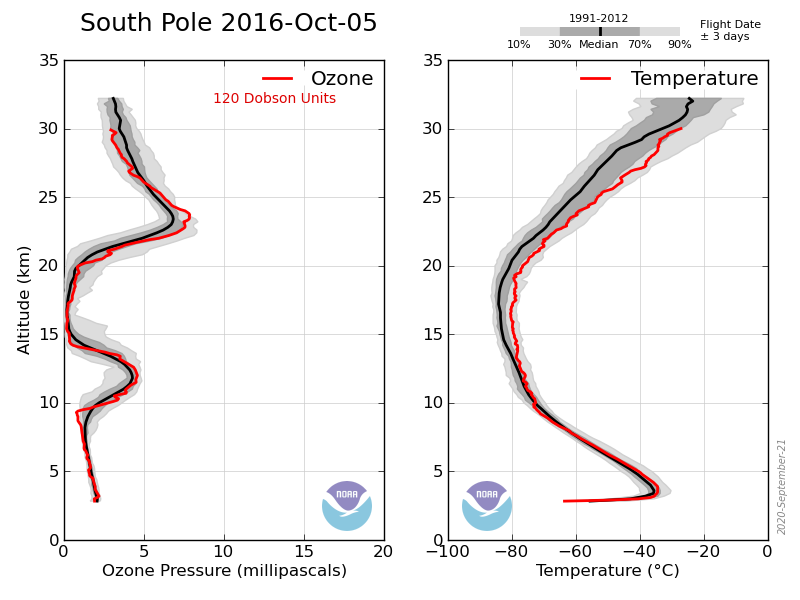 Total atmospheric ozone during October. I think you would have found almost certainly it was. I simply shook my head in disgust when the HFC world saving announcement was made recently. The entire global warming / climate change financial gravy train has relied on fear mongering and false modeling to encourage weak minded leaders to throw wads of cash toward the phony climate saviors. But, big speed bump, there is likely a global cooling period coming along, and soon. The phony climate saviors cannot afford to be outed in their gigantic scam, so they need to announce that their brave and insightful policies are making the difference. So please send more money, and we’ll keep saving the world. Trust us. It is still an estimate, but it is simply not the same thing as residence of an individual molecule of carbon dioxide. I am easily confused (age). If the oceans are naturally warming, and if more CO2 is released from a warmer ocean, why is there any expectation that CO2 will return to “pre-industrial” levels until the oceans naturally return to pre-industrial temperatures? If we buy the mantra that we are coming out of the little ice age during a natural warm period in an interglacial, don’t we have to assume that CO2 will follow (respond to) changes in ocean temperature? What we don’t know is when the current period of warming will peak (it will- it always has) and the gradual decline since the last glacial retreat will resume. Separating natural climate change from any anthropocentric influence remains the biggest challenge. An excellent report as always. 1. CO2 residual time. Anyone looking at the 30 detailed OCO-2 images released in April of this year the residency time is limited. The replacement in the NH is annual. I am yet to see any commentary other than my own on these images. A lot depends on the maturity of inter glacial cycle. At present it is very mature and appears that the biospheres are out-welling more than adsorbing. The temperature profile is also important for seasonal atmospheric transport volume, mainly southward. The entire vertical column out to 100km is in saturated equilibrium with the troposphere, and as the atmosphere volume reduced the oceans would release. Etc. 2. Ozone hole. This particular area has interested me for years. I believe that you are correct that CFC’s are not relevant. I am unsure in your post above if you are inferring the PSC’s cause ozone destruction. If that was the case then the ozone hole would have been there in the late 1970’s, as the PSC area was also there. The reduction of ozone started at that time and grew through the 80’s, along with the increase in temperature. You state it is a natural event, I agree but there never has been an adequate quantifiable case put forward to support that theory. My own observations conclude that the loss of ozone over Antarctica is explainable, quantifiable and how it fits into the larger realm of events. It serves a very interesting purpose. Why does it peak at that time?. Why does it start earlier some years than others, and go for longer?. What affects the size of the “hole” on a day to day basis. These are answerable once you completely dismiss CFC’s. I will send you a link to my findings when complete.. Most CFCs were used in Northern Hemisphere…so according to the theory, that’s where the big hole should be. Can someone explain why it isn’t ?? is the cause something totally different; like volcanic aerosols ?? Seasonal atmospheric transport does a good job of global distribution of all gases. So why are the holes different if the gas & radiation levels are ~ the same a both ends ? obviously antarctic is much dryer and colder than arctic. there are huge sendings of chlorine and bromide ions from arctic sea to arctic atmosphere, destroying arctic ozone layer much more than antarctic’s … oh… wait … where am i wrong … ? Well worth a read, esp. Those covering ozone at temperature too warm for PSC formation. I look forward to every new and riveting posting by Dr. Tim Ball. This one is particularly far ranging and exposes many of the false science involved in both CFC, CAGW Alarmism and crony capitalism. 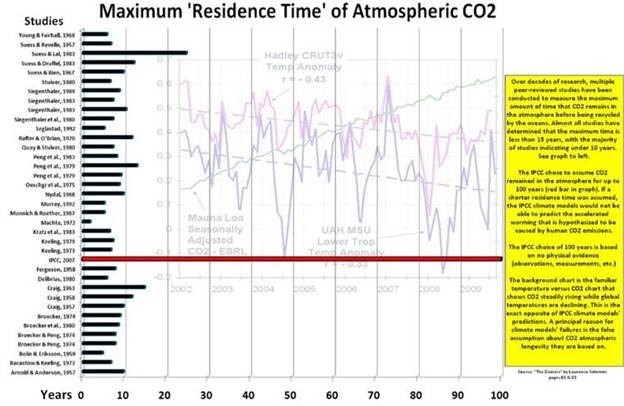 Regarding CO2, I think that Professor Murry Salby’s calculations have clearly shown that CO2 residency in the atmosphere is closer to 5 years than 100 years as the IPCC thinks. Professor Salby also has demonstrated, with study of the annual variation of CO2 levels, that man-made CO2 is not the cause of the increase in CO2 in the atmosphere. I am looking forward to Dr.Tim Ball’s next demolition job. War on coal to counter the non-problem of climate change: Change to natural gas increases water vapor which increases rain which increases risk of flooding. Can you please provide an explanation of how natural gas usage increases water vapour significantly? “significantly?” is beyond my pay grade. NOT significantly. Shouldn’t be beyond your pay grade. 891 kJ is enough energy to vaporize millions of billions of billions of molecules, and is precisely what is done to cool hot steam to produce electricity. Ozone holes are localized phenomena that have to do with ozone distribution from the tropics where they form to the higher latitudes by atmospheric circulations. They are not evidence of ozone depletion as described in the Montreal Protocol which implies a sharp and dangerous decline in mean global total column ozone. The data from both satellites and ground stations do not show any evidence of such a global decline. The patent on HFCs has expired now. Dupont made their billions so there is no business motive any longer. There is a replacement chemical (family of chemicals) that will do exactly the same job and are not greenhouse gases. Technically, this new treaty is meaningless because the replacement chemicals are not more expensive. Even more astonishing than banning CFCs and forcing people to buy new refrigerants and fire suppressants was the extremely manic, illogical, and in fact cruel declaration by the Boomers that NO2 itself is a pollutant. Claiming that CO2, methane, and nitrous oxide are pollutants is just child’s play compared to declaring NO2 a polutant. But it satisfied the need of the Boomers to feel righteous indignation at their own wealthy, scientifically advanced country, and it pleased the Keynesian Generation to make new economic systems by outlawing what actually worked. It certainly is a pollutant, in cities in Europe about 80% of NO2 is due to automotive exhausts, what makes you think it is not a pollutant? Thank you Dr. Ball for another worthwhile exploration of the subject of CFCs and HFCs. is good to see a level-headed scientist take a stand against banning yet another useful chemical. Why not use sulfur dioxide as a replacement, going back to the refrigerant commonly used into the 1930s before it was replaced by much safer Freon? I encountered an old SO2 refrigerator purchased by college friends in the early 70s, really cheap from a junkyard. I walked into their apartment and immediately smelled sulfurous odor, but one of the bad effects of SO2 is that it deadens the smell receptors so they didn’t smell the leaking refrigerant. I told them to junk the machine. Fortunately they did. At the time of low activity geomagnetic large influence on the distribution of ozone has Earth’s magnetic field. Ozone is moved closer to the Earth’s poles. Is there any way I could convince you to clarify and expand on what you were trying to say? create, but neither of them is necessarily connected with a solar flare. values smaller than −100 nT only a few times (Table 2). to 6 GV (Figure 5). interesting and distinct event, worthy of a more detailed future study. important information to the scientific community in the context of space weather studies. And not a single digit of accounting for the environmental burden of prematurely scrapping millions of tons of perfectly good, perfectly maintainable pieces of refrigeration equipment including home and office air conditioning units and grocery store freezer units, when their replacement is forced by subsequent regulations, unavailability of replacement parts, or artificially high costs. And, in the Keynesian mindset, all this waste is only good for the economy because of all the jobs it will “create” due to all the new equipment that will be required to be manufactured and installed. And we wonder why our economy barely grows. What is the explanation for any of the ozone depleting gases for defying the trade winds and only affecting the south pole? Let’s see pressure anomalies over the southern polar circle and galactic radiation. Chlorofluorocarbons were little used for refrigeration until better synthesis methods, developed in the 1950s, reduced their cost. Source Wikipedia. Gordon Dobson first observed the Antarctic ozone hole in 1956.It’s a natural feature of the Antarctic stratosphere in spring and it results from the replacement of air containing ozone with air from the troposphere that contains little ozone (and a lot of NOx) as part of the process of the final warming of the stratosphere. The arrangement of land and sea in the northern hemisphere precludes the generation of an enduring hole in the Arctic but fleeting holes do occur frequently in the month of March. But for the release of NOx by the soil the partial pressure of ozone would increase all the way to the surface of the planet. 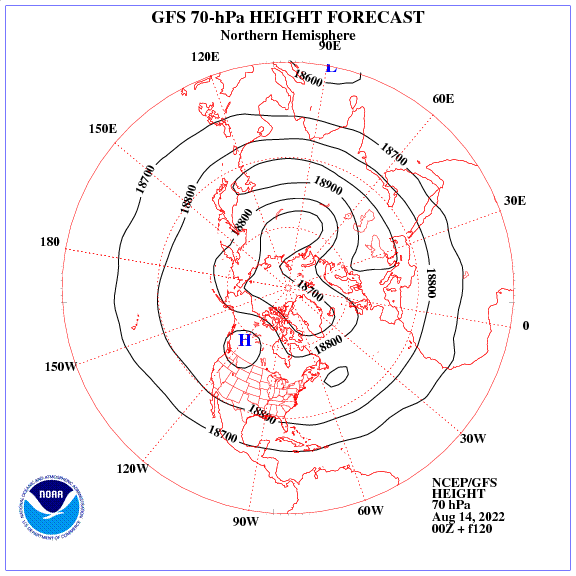 The higher tropopause in the northern hemisphere in summer is due to the abundant land masses of the northern hemisphere and their release of NOx. 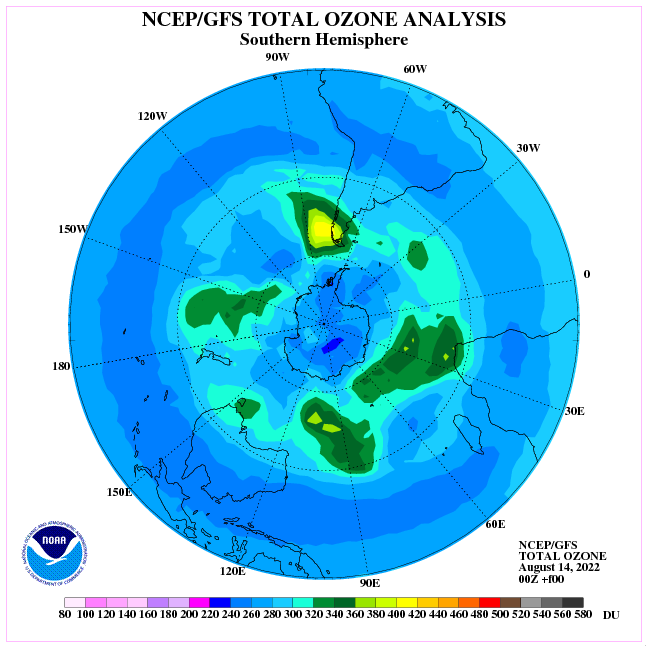 Just check ozone distribution against the distribution of NOx and you can draw your own conclusions. The ban on CFCs via the Montreal protocol was the first major achievement of the environmental movement and it led to the assertion that CO2 emissions would result in global warming. The southern hemisphere has not warmed in December for seven decades.. Neither the assertion that the ozone hole is the result of human activity nor the assertion that the planet would warm if the CO2 content of the atmosphere increased have the slightest foundation in observed atmospheric behaviour. It really won’t matter what they do. By the time they have electricity prices jacked up to unaffordable rates, you won’t be able to afford to run freezers, fridges or air conditioning. Which is already happening in places like Ontario. Where seniors have been forced to shut off their air conditioning in the hot summers and go and sit in air conditioned malls all day. Or the grocer who expanded and renovated his grocery store and put in all new refrigeration, and was then forced to close down 2/3 of his store including meat and bakery departments because his power bill went to $5000,00 a month from around $1500.00 a month. Which essentially turned him into just another convenience store. What I haven’t seen discussed, and I think highlights the insanity of this attempt to ‘save the planet’ by banning HFCs is the incredibly small quantity of HFCs that are in the atmosphere. According to the IPCC AR5, taking the most common automobile refrigerant HFC134a, the atmospheric concentration is 63 parts per trillion. Put on the same scale that CO2 is measured, that is 0.000063ppm, as compared to 400ppm for CO2. So there is only 0.00000016 as much HFC134a in the atmosphere as there is CO2. Even if you apply a dubious 1,000 factor of GWP, HFC134a would only have .00016 the impact of CO2. Then consider that humans have added ~600 billion tons of CO2 to the atmosphere over the last ~19 years, and it hasn’t caused the temperature of the Earth’s atmosphere to increase. The small positive trend over that time period is due to the natural 2016 El Nino. Then consider that refrigerants for cars, buildings, refrigeration are not constantly added to the atmosphere in the same way as burning fossil fuels does, because they are sealed into systems for decades, and like the old R12, most of them can be recovered. To ban them when they are so insignificant is insanity, as their proven positive benefits far far outweigh the insignificant potential, unproven harm. And to claim that the ban on HFCs is ‘saving the planet’ from catastrophic warming a hundred years from now is just ludicrous. It’s just an example of bureaucrats doing what they do, pushing an agenda, justifying their existence and controlling peoples’ lives. Of course DuPont acquiesced to banning R-12. Their patent had expired by the time of the Montreal Protocol and they needed new protections against competition for their new refrigerant, R-22 and R-134a. The price of R-12 was falling as other companies were getting into the market, thus regulation was desired by DuPont to bar any competing chemical companies. Now that R-22 and R-134a patents are expiring, well golly, those chemicals are just as evil as R-12 was and now need to be banned. Can I also state that when I had to convert my truck’s A/C system over to R-134a, that it didn’t work as well either? As an auto mechanic in the 70s I did a lot of air conditioning work with R-12. It was common practice at the time when filling a system just to let a partial can left over vent – you could see the condensation of the heavier-than-air R-12 literally rolling along the ground. At the time I always wondered how on Earth it could ever get up into the upper atmosphere – I have ever since then been skeptical of what we were being told. R-12 worked great, too – when a system was working good you could get inside air vent temps in the low to mid 30s F and it was always a possibility to have condensation freeze up on the evaporator. I don’t even come close to that problem with “modern” auto air conditioning systems! Muons, heavier versions of electrons, are around us all the time, a byproduct of the cosmic rays that shoot out from supernovae and other high-energy events in space. When particles from those rays hit Earth’s atmosphere, they often decay into muons. Muons are abundant on the surface of the Earth, but in Axani’s University of Alberta underground office, shielded by the floors above, they might be few and far between. A pocket detector would be the perfect gadget for measuring the difference. Now a doctoral student at Massachusetts Institute of Technology, Axani has nearly made this device a reality. Along with an undergraduate student and Axani’s adviser, Janet Conrad, he’s developed a detector that sits on a desk and tallies the muons that pass by. The best part? The whole system can be built by students for under $100. Excuse me? My CFC’s/HFC’s are safely contained in my refrigerator – and have been for 15 years. Why ban a ‘utility’ rather than ‘regulate’ it’s handling/handlers? W/o concern about their environmental ‘danger’, just don’t vent them to the atmosphere! I usually don’t like spaming, but i think you can and must spam this for the next 30 years, time for it to actually reach brains. Following up on nabbiz:How are projections of emissions of HFC made? And how extensive and reliable are measurements of HCF concentrations in the atmosphere? Anyone have some good references? The always quoted 1000 GWP number is meaningless without such information. At the time of low solar activity will occur pressure anomalies over the polar circle. A few years ago I was summoned to appear before the Canadian Parliamentary Committee on Ozone in Ottawa. If by a few you mean ‘~twenty’! All these statements except #5 (except that it was General Motors that developed it) are untrue. Dupont strongly opposed the phaseout of CFCs in aerosols in the late 70s but started developing replacements as a result of that phaseout. In March 4, 1988, Richard E. Heckert, chairman of E. I. du Pont de Nemours & Company, wrote a letter to three Senators who had sharply criticized the company, he said there was no reason for Du Pont to stop making chlorofluorocarbons. Shortly thereafter the report of a NASA meeting showed that the writing was on the wall and Dupont quickly changed its strategy. Let’s look at the forecast of circulation in the lower stratosphere at the northern hemisphere. In the 1970’s I attended a talk by Sherwood Rowland and asked a few questions about his new theory, recycled from his nitric oxide theory to help block the SST. Remember that the theory was based on the increase in Chlorine in the stratosphere. I asked what the historical level of chlorine was and how much it had risen from CFC use. I still don’t know the total level in the stratosphere during the peak of CFC production and what percent increase was possible in the total level. Recently I heard the report of a new paper showing that the ozone hole was being repaired because of the Montreal protocol but I don’t believe that it even addressed that important issue, i.e. the change in Chlorine levels. CFC destruction of the ozone layer is a Halloween monster that won’t die. The Royal Meteorological Institute (RMI) at Uccle (Belgium, about 50° latitude North) measures total ozone column since 1971. The overall yearly pattern is a sine-wave going from a maximum of about 370 DU in spring to about a minimum of 280 DU in October. 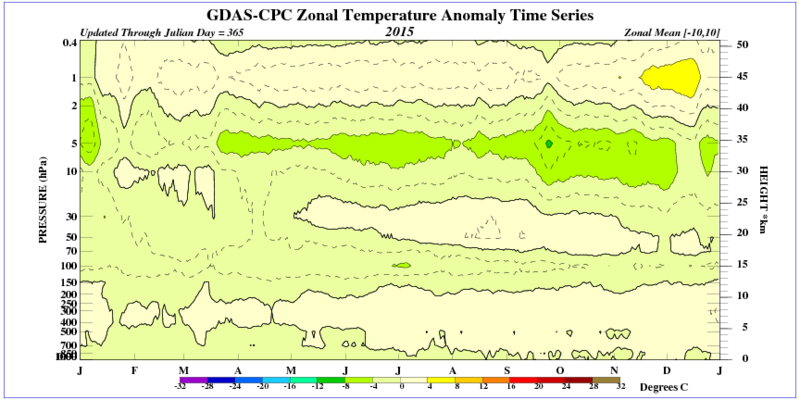 The day-to-day natural variations about this mean pattern are enormous, as seen by the grey bands (2 sigma bands) in this picture: <a href = "http://ozone.meteo.be/meteo/view/en/113200-ajaxcontroller.html/1569014/image.jpg&quot; . We find the same pattern in our measuring station in Luxembourg, with a more or less zero trend.since 2002. What I want to stress is that nothing could be more wrong than assuming the ozone layer a well-behaved, only moderately wiggling blanket.